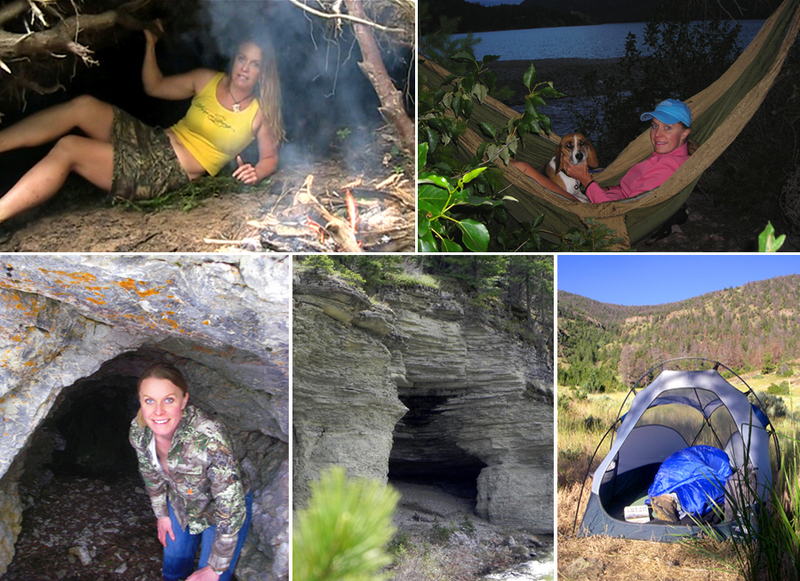 Welcome to my segment on Survival Shelters, Primitive Shelters, and Shelters in Snow. Shelters can range from very primitive to very elaborate depending upon what you have available and how many calories you can expend making or erecting such a shelter. If a tent is available of course that makes a nice shelter. Using camping hammocks works well in mild weather conditions. 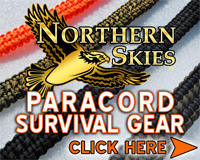 They are lighter and can fit into an emergency kit. Reusable emergency bivy sacks that are breathable make a quick at hand shelter. Log cabins can be built if homesteading is an option. In a jungle environment, a jungle bed or hammock can be made. A jungle bed can be made by lashing cut tree trunks together with support logs lashed in an x to hold the bed. A jungle hammock can be made by lashing a tarp folded in half to two tree trunks used for hammock side supports. In snow conditions an igloo can be made but it requires many hours to make for an inexperienced person and it requires a high expenditure of calories. A variation on the igloo is making a trench covered by blocks of snow propped together in an inverted v-shape. A quinze is similar in principal but quicker. To build a quinze pile backpacks or debris to a height you will need to crawl into a shelter. Then pile snow 3' thick all around your backpack or debris pile. Let the snow set up for about an hour to harden via recrystallization. Place numerous sticks in the quinze dome 2' long pointing to center. Remove backpacks or debris to complete. Sticks, branches, trees or skiis and ski poles can be used as supports for a tarp or a poncho shelter. So many variations are possible that they will not be listed here. If it works and can withstand the elements, then it is a good shelter. A trench snow shelter is very quick and easy. Dig a trench in the snow. Erect a debris shelter overtop of the trench to complete. Snow caves can also be used. A tree trunk depression snow shelter in snow at the base of trees or rocks work well also. Branches can be placed upon the top of the opening. Dig and entrance to a snow cave sleeping area. Use a snow block as an antrance. Bring a stick inside the cave with you and thrust up through the roof of snow cave. A hollow can be dug out at the base of an evergeen tree trunk to create a snow cave and entrance for a snow cave with added evergreen insulation on top. Crawling underneath a cedar or a birch with low hanging branches will also work for an evergreen shelter. Taking shelter under evergreen trees in a forest will increase the thermal layer above an individual by around ten degrees. Shelters can also be found in natural caves, and rock crevice shelter or underneath a large uprooted tree makes a tree shelter. Along rock cliffs look for overhanging ledges and rocks. Debris can be added to these overhangs for an improved shelter. Pack Ice in colder regions can create natural overhangs and caves where the ice is pushed up along the shoreline or shoal. Pack ice shelters provide great insulation and escape from the elements. Wrapping up in animal skins where available can help and by propping up animal skins with sticks you can make an animal skin shelter. Gutting a large animal and crawling inside will also work in extreme situations. Pioneers sometimes would climb into their own horse; using it as an animal shelter to save their life or if the horse has to be put down for medical reasons. This is not advocated, it is only provided for historical perspective and validity to animal shelters. A live animal such as a horse can be hobbled and used as a windbreak and a shelter by placing a tarp overtop and staking it out where trees are not present. In dense areas of small evergreens , lash together the tree tops making a lashed evergreen shelter. Spaces in between can be willed with more cut evergreens. Willows, cattails, and heavy grass can be lashed or woven together creating a good shelter. A hollow log can be made used for a wonderful hollow log shelter. Mountain men, Cowboys, and others knew where such logs were and they would return time and time again. Wigwams and wickiups were used by the Ojibwe peoples. They were covered with Birch bark, Cedar Bark, or animal skins. They are quick to assemble by bending cut saplings into arches and then tying with cordage in a dome shape. 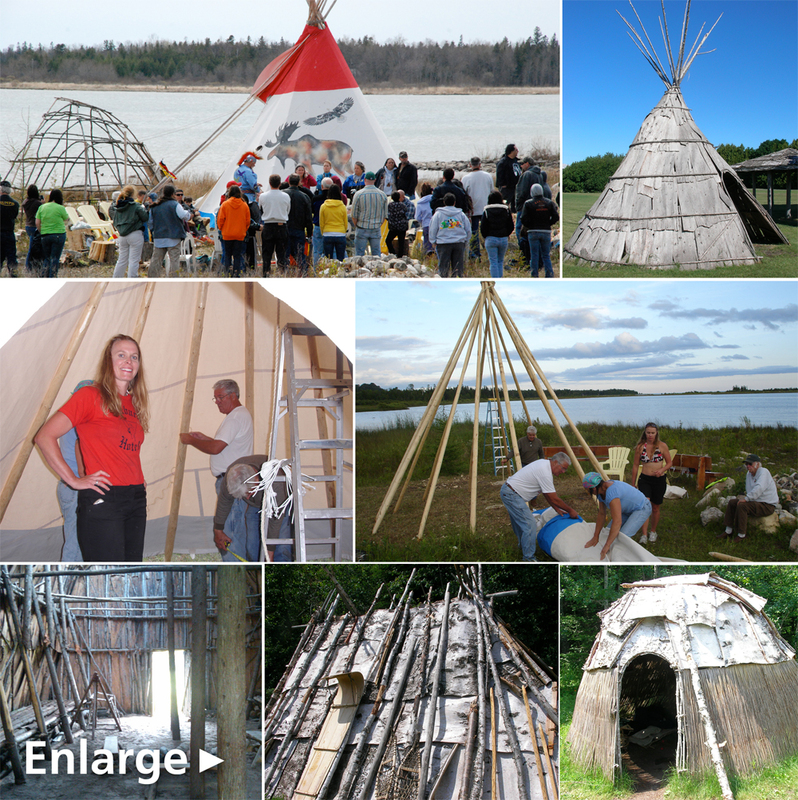 Other tribes built Teepees or tipis by using long poles in a conical structure and placing animal hides, cedar bark, or birch bark around the circumference of the cone. Post-European era tipis and wigwams and wickiups were often covered with canvas. The Hurons erected long houses whic were pole structures often covered in cedar bark or birch bark. Some tribes and pioneers erected sod houses. These are just a few shelter ideas and are not meant to be all inclusive. Note: Remember, think outside of the box, it could save your life. I once spent the night underneath my upside down row boat in a torrential downpour. I once met an Inuit man from Nunavut who survived overnight in -25 degrees "Out on the Land" - (a term those in the Arctic use to refer to barren treeless tundra and permafrost laden vast land) by lying on his side on the leeward side of his snowmobile with his back to the wind for a snowmobile shelter. He had no where else to walk to in 40 mile and hour winds. His actions saved his life. He lost some fingers on the hand that was attached to his arm that had limited circulation due to his body lying on top of it. All shelters can be insulated by adding insulating vegetation like an evergreen bed and blanket of balsam branches, cattail beds and blankets, dried grasses or leaves just to give you a few examples. There are many plants that will work well. Cedar and birch bark works great for a insulating under layer and moisture barrier and pile them on top for cedar bark blanket or a birch bark blanket.